Tamil band ‘The Casteless Collective’ was stopped from performing a song that has the word ‘Modi’ in it, as the word refers to Prime Minister Narendra Modi. The band was performing on Sunday evening at Besant Nagar beach, in a cultural event – Chennai Kalai Theru Vizha. A police officer in charge asked the organisers to stop the singers from performing. In a widely circulated Twitter video, (shot by The News Minute), the police officer can be seen making gestures to get the singers to stop. In the video, Nityanand Jayaraman, one of the organisers of the event said that the police asked the band to stop performing as “we are not supposed to sing about Modi”. The band sang three songs after this incident, and concluded the programme. The song was titled ‘Modi Mastan’, and discussed the political atmosphere in the country in general. 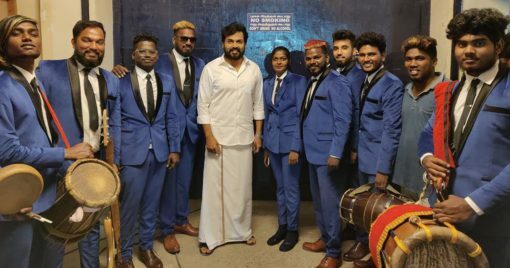 ‘Modi Mastan’ is composed along the lines of another song in the ‘gaana’ genre [popular folk music style in Tamil Nadu] that was popular in the 80s, said Arivu. “The song discusses the plight of the people in this country in general. The moment they heard the word ‘Modi’, they came, and stopped us from singing. They didn’t even listen to what we are singing about,” he added. The 19-member band was formed in 2017, and performed for the first time in January 2018. It comprises four rappers, seven instrumentalists and eight gaana musicians. The band is a wing of the Neelam Cultural Centre led by Tamil director Pa Ranjith. Ranjith, whose films have been acclaimed for their dalit assertion, has been outspoken about caste atrocities that prevail in the state. The band’s first video production titled ‘Magizhchi’ was a hit, and garnered popular support for its bold presentation. Eight songs that were included in the album discussed eight different social issues. “We are a band that communicate directly with the people,” said Arivu. “Each week, we participate in different kinds of activities in different places and streets. We are aiming to create awareness about these issue among people,” he added. When asked about the name of the band, he explained that it was chosen to represent a casteless mentality. “Indian society as whole is in the clutches of caste now. People should be able to accept each other beyond these caste barriers. Annihilation of caste begins with annihilating it from your mind,” said Arivu.